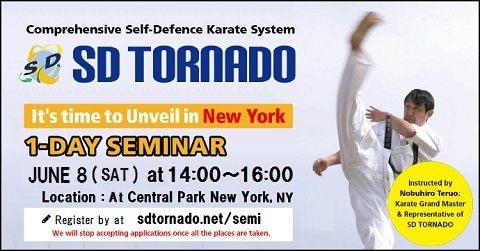 SD TORNADO is a modern style of Karate originating in Yamaguchi prefecture in Western Japan. SD TORNADO teaches a practical and comprehensive self defense system developed so, with continued practice, regular people can acquire the necessary self defense skills. Nobuhiro Teruo, a Karate grand master and a representative of the SD TORNADO developed the self defense system based on traditional Karate while integrating aspects of many other martial arts such as "judo", "aikido" and "muay thai". The SD TORNADO system teaches defense techniques to effectively cope, not only with one on one unarmed combat, but also to successfully defend against armed attackers and multiple opponents. The Prime focus of the SD TORNADO technique is to get opponents to lose balance, diverting attacks skillfully with both "tachi-waza" (standing technique) and "ne-waza" (ground grappling technique). Our system does not just rely on physical force alone, but also in protecting one's own self with a rational defense system and even disarming and diasbling an opponent into submission in extreme situations. Our curriculum is designed so that anybody can acquire the necessary skills in step by step lesson plans and active training against an adversary in a variety of scenarios which enables students to progress to higher levels and achieve new goals. The class is designed so that not only athletic men but also regular people, male and female, young and old alike can enjoy the practice according to their physical ability and capacity.